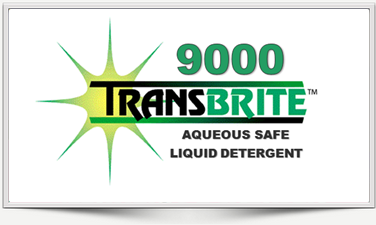 TRANSBRITE 9000 is a Highly Concentrated, ALUMINUM & MULTI-METAL SAFE, Liquid Alkaline Detergent engineered to produce superior cleaning results for the removal of the toughest contaminates on all metal & plastic surfaces. TRANSBRITE 9000 is Aerospace Approved and because of its Potassium Based Formulation, Free Rinsing Capabilities and Electrical Properties, it is ideal for cleaning Aircraft Parts & Mechanisms, Alternators, Electrical Motors, Generators, Traction Motors and their related components. TRANSBRITE 9000 performs in all SOLVENT-FREE, aqueous industrial parts washers from heated high-pressure spray cabinet & conveyorized systems to free standing manual and immersion type tanks. 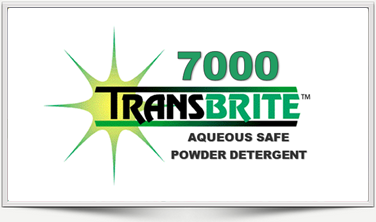 TRANSBRITE 7000 is a 100% Active, ALUMINUM & MULTI-METAL SAFE, Alkaline Powdered Detergent engineered to produce superior cleaning results for the removal of the toughest contaminates on all metal & plastic surfaces. TRANSBRITE 7000 performs in all SOLVENT-FREE, aqueous industrial parts washers from heated high-pressure spray cabinet & conveyorized systems to free standing manual and immersion type tanks. 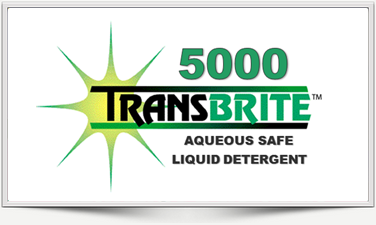 TRANSBRITE 5000 is a Highly Concentrated Surfactant Based, ALUMINUM & MULTIMETALSAFE, Alkaline Liquid Detergent engineered to produce superior cleaning results for the removal of the toughest contaminates specifically synthetic lubricants, oils & greases, cosmoline &other rust protective coatings and other tenacious contaminants. TRANSBRITE 5000 performs in all SOLVENT-FREE, aqueous industrial parts washers from heated high-pressure spray cabinet &conveyorized systems to free standing manual and immersion type tanks.